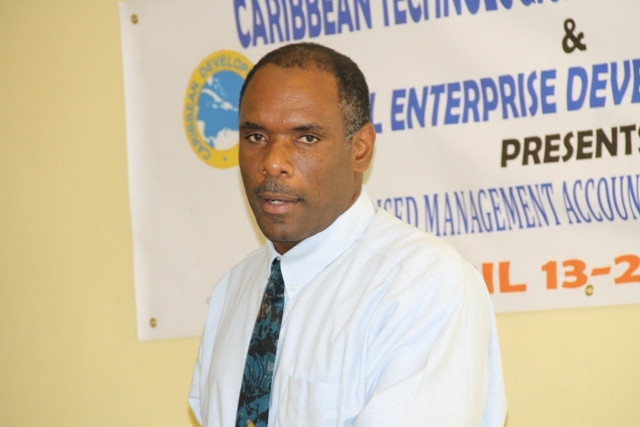 NIA CHARLESTOWN NEVIS (APRIL 15, 2015) –Permanent Secretary in the Ministry of Finance Colin Dore says that the Nevis Island Administration (NIA)wants to lend greater support to small businesses on Nevis, in addition to the financial assistance it is providing. 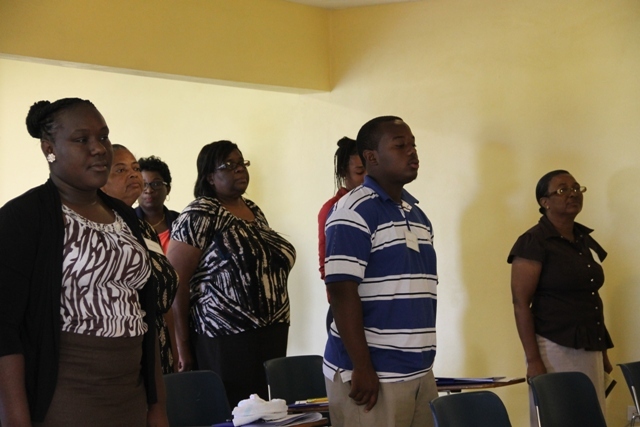 Dore who was at the time delivering remarks on April 13, 2015 at the opening ceremonyof a Caribbean Development Bank-sponsored eight-day workshop that would teachmicro, small and medium-sized businesseshow to use an accounting system to become more efficient and successful in the management of their businesses, told the participants that they should see themselves as fortunate. “The workshop…could only facilitate 15 persons so I want you to see yourselves as the first fortunate 15 because…we had to look at those entities that would have a significant effect on the economy in the short term and that’s why you are selected. “We looked at your track record, we looked at what you are doing, how you are going to impact the economy going forward,” he said. However, the Permanent Secretary assured that the training exercise was only the beginning and the same workshop would be held for a second batch, since the intention is to ensure that all small businesses in the medium term would have some kind of accounting system implemented in their businesses. Dore spoke to the importance of good record keeping and reminded the participants that it would help with their cash flow and would track both their collections and what was due to be collected and as a result would help them in their day-to-day planning in terms of how they should schedule their expenditure based on the inflow if the revenue. The Permanent Secretary stated that the accounting systems would also assistthe businesses where the Inland Revenue Department was concerned. “It’s going to help all of us in ensuring that as we move forward, we move forward in an atmosphere where you can function, government can function, and in the end government can continue to give you support as we move forward,” he said. He noted that the NIA would provide the necessary support to SEDU for small businesses on the island in the hope that they would eventually become major employers who would have a significant impact on the economy. Meantime, Dore said the NIA was heartened that by the rate of registration of small businesses on Nevis over the last three years. He said there was an average of 300 registrations per year and as such small businesses are poised to become the catalyst for growth within the economy. The Ministry of Finance official said that the manufacturing sector is taking shape and that the Administration intends to also push forward in that sector because Nevis has the requisite creative skills to make things and as such, there is the need to harness and give support to those skills. He also reported that the retail sector is showing growth which meant that an increasing number of persons are getting involved in buying and selling and that is something good. He expressed the Administration’s view that the time had come for the people of Nevis to move from seeking employment to becoming employers.